Many people have strong opinions about vaccinations, and today we are linking to an article by Dr. Thomas Rau of the Paracelsus Clinic in Switzerland. Here he lays out some science, logic and his experience to help us make better informed decisions about whether or not to vaccinate. He says that “significant problems will be experienced whenever children – or adults – are simply vaccinated to achieve “vaccination coverage” and that in many cases vaccinations may be more harmful than the disease it allegedly prevents. “This particularly applies to diseases that might be subjected to vaccination by ordinance, such as tick-borne encephalitis, hepatitis B, HPV infections amongst girls, swine and avian flu.” For concerned parents considering vaccinations for their children, Dr Rau offers advice on timing of vaccinations as well as tips to help avoid adverse side effects. Whether or not you decide to vaccinate, a healthy immune system is key. Give your body an extra immunity boost with Regulat® pro Bio. 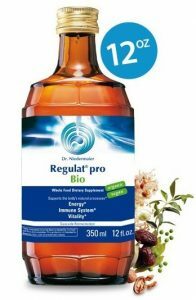 Regulat is a liquid whole food supplement made from organically grown fruits, nuts and vegetables, produced by the unique patented process of live Cascade Fermentation. This entry was posted in Boosting the Immune System and tagged immune system, Regulat, Regulatpro bio, side-effects of vaccinations, Vaccinations on August 15, 2018 by Vicki.